What comes to mind when you think of a mouse? For many, the classic image of a grey little creature with a chunk of yellow cheese in their paws might pop into our heads. Or maybe you picture a mouse scurrying around your house in a hurry and ripping open cereal boxes. Whatever’s the case, it’s likely that you don’t want mice infiltrating your home and snacking on your groceries. Which is why you should understand what does a mouse eat in the wild since it will help you learn how to keep these rodents out of your house. So let’s explore what mice eat in the wild and how our homes have become alluring buffets for mice. Mice love cheese: Mice can and do eat cheese (as you’ll learn later in the article, they eat almost anything), but it’s actually not their favorite food! Mice are herbivores: Nope, mice eat all kinds of foods, not just plants. Stay tuned! Mice eat cardboard: You might find some cardboard chewed up by mice in your home, but they’re not eating it! It’s for their nests. Mice are timid and docile: You may have heard the saying, “timid as a mouse.” Actually, mice can be quite aggressive and may even turn cannibalistic in times of severe hunger and duress. So, What Do Mice Eat in the Wild? Picky is not a word you would use to describe a mouse. 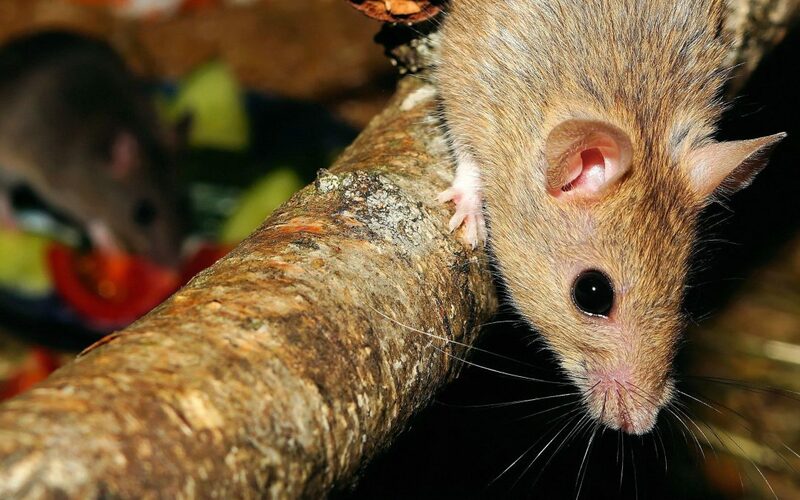 Mice have a surprisingly varied diet – there’s not much a mouse would turn down. They are natural foragers and are happy eating many different foods in the wild. They do, however, have their tendencies and preferences. So, what’s on the menu for a wild mouse? Are mice herbivores? You might think that these little creatures would be vegetarians, but actually, they are not. Mice are omnivores, meaning that they eat both plants and meat. Mice will eat carrion or meat scraps in the wild. When it does comes to vegetation, however, mice enjoy a wide variety of plants in their daily diet. Grass and grains, in particular, are staples of the wild mouse diet. They will eat any type of plant available including grass, fruit, corn, nuts, seeds, oats, roots, vegetables and other plants. Do mice eat insects? In the wild, mice will eat many smaller insects as they go about their day. The mice will also hunt small snails, centipedes, larvae, worms, and crickets to munch on and feed their appetite for protein. Do mice eat roaches? Sure, a mouse might eat small insects, but what about a big hefty cockroach? The answer is yes – mice can, and will, eat roaches! What Do Mice Eat in the Home? We’ve looked at the natural sources of food in the wild mouse diet, but what do mice eat when given the free-range of the kitchen and pantry? Just like in the wild, in the house mice won’t turn down much. However, while mice may not be picky eaters, they do have their favorite foods. Here’s a look at some of the foods that mice prefer the most. Do mice eat cheese? If you grew up watching cartoons of mice chomping down on a big chunk of Swiss cheese, you might be surprised to learn that mice actually don’t prefer cheese over other foods. That being said, a mouse probably won’t leave a perfectly good chunk of cheese behind and will still likely eat the cheese if it finds some. Do mice eat meat? Mice are omnivores, meaning they do eat meat. They will nibble on leftover meat scraps or eat insects that they find around the home. Do mice eat pet food? If you have pets at home, beware! Your dog, cat, and bird food are major temptations for hungry mice. They will happily munch on seeds and pellets found in many bird seeds, just as they will rummage through dog and cat food that’s been left out or stored in paper bags. Do mice eat peanut butter? And just like many humans, mice have a bit of a sweet tooth. They like chocolate and peanut butter and will have a heyday in your candy cupboard. Cereals are also highly attractive to mice. Mice are investigative creatures. And this trait holds true for their eating habits as well. Mice tend to be very curious about their food, nibbling on many different items they’ve stored rather than feasting on a big chunk of food all at once. Mice are also hoarders. They love to raid pantries and cupboards and bring their findings back to their nests to save for when food is scarce. This is not only a frustrating thing in and of itself, but this food storage will attract other pesky pests like beetles, weevils, and other insects. Which means that a simple mice infestation can also quickly turn into a full-blown pest attack. And mice won’t typically eat non-food items. So if you find cables, wires, cords, fabrics, boxes, and other items chewed, this is likely because the mouse is building its nest not eating your stuff. While mice may love the welcoming buffet that your home provides them, you should do everything you can to keep wild mice out of your home. Mice can cause all kinds of issues for you from damaged food and chewed up wires to diseases that they carry. So by eliminating foods that wild mice love you will able to keep your home mice-free and keep yourself safe.